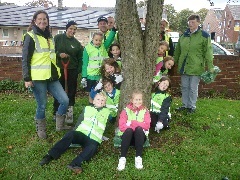 Nine students from Year 6 joined their Learning Mentor Shanne Evans, WDH Tenant Involvement Officer Claire Secker and resident Kate Ingram to tuck 20 tulip bulbs and 250 daffodil bulbs under shrubs and trees, adding mulch to protect the plants from frost over the winter. The pupils – seven girls and two boys – will return in the spring to see the flowers in bloom as part of a joint venture between the school and WDH to encourage the children to have pride in their community, foster good relationships with the bungalows’ residents and show the youngsters the range of skills needed in different kinds of employment. 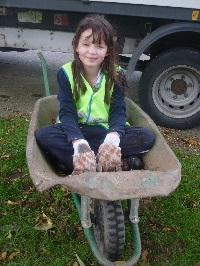 Residents paid for the bulbs, which Kate showed the children how to plant successfully, while Stephen Haycock, Katie Hopkinson and James Durrow from contractors Sodexo lent a hand with wheelbarrows full of mulch.